Carmike Cinemas cancels The Interview after Sony hacker terror threats. 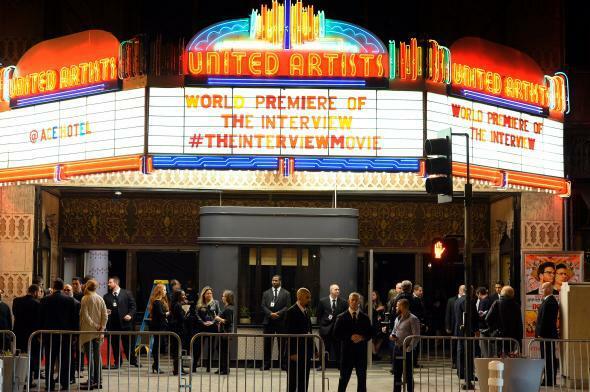 The Los Angeles premiere The Interview on Dec. 11, 2014. Carmike Cinemas on Tuesday became the first theater chain to bail on screening The Interview, which was scheduled for release on Christmas Day. The Georgia-based theater operator runs more than 2,500 in the U.S. Carmike’s decision to pull the Sony Pictures comedy about the assassination of North Korean leader Kim Jong-un came after “the same people purporting to have carried out a devastating cyber attack on the movie studio threatened to escalate to physical terrorism surrounding the planned Dec. 25 opening of the Seth Rogen comedy,” the Wall Street Journal reports. Under pressure from local theaters, Sony decided to give theater operators the option not to show the movie. Earlier, BuzzFeed reported both Franco and Rogen had cancelled the remainder of their media appearances in the run up to the film’s release.